Can you even imagine what it was like for Peter when he was in the fishing boat and saw the Lord Jesus walking toward the boat on the water? I mean how do we as humans even wrap our head around that? I can just imagine how Peter felt inside his heart when he saw the Lord. He probably was so excited he wanted to just jump out of that boat and go directly to Jesus. Peter was a fisherman and he knew the water and he knew that he could sink and drown in that sea. Yet he asked Jesus to command him to come out to Him. I think he knew that by doing that he would be fine. As long as Jesus was in control everything would be just fine. So Peter standing on his faith in Jesus climbed out of the boat and started walk on the water towards Jesus. He was walking on the water!!! I mean can you even imagine how you would react if that were you or me? I would be so stoked and I would be like YES!!! I am walking on water to my Jesus!!! I think that is exactly how Peter felt. He was stoked, excited and then the wind started blowing stronger and a storm was rolling in and the waves started growing bigger and bigger. 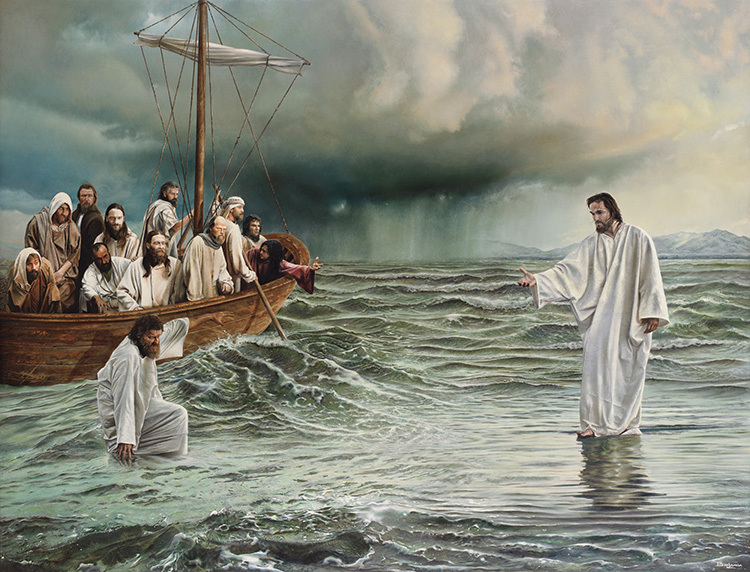 Peter seeing the wind and waves rising was frightened and it was when he took his eyes off of Jesus for just a second and started to worry about the storm that he began to sink. Don’t we all do that in our life? I know I do. I will be walking to Jesus and doing great and all of a sudden the wind will rise and those waves will start rolling and I panic and like Peter did and I begin to sink into that water like a big old stone. The thing is that just like Peter we as Christians are so lucky. We can just call out to Jesus and He will be there for us. He will Lift us out of that very deep dark water and He will take our hand and lead us back to the light of His love. I hope as each of you go out in the world today you warm someone else’s life with an act of kindness or a smile. It really will make your day a Simply Heavenly one. God bless you!! !